If you follow my twitter you may be aware that in the past couple of weeks I've been organizing a project. Everyone involved will be blogging from the 1st to the 24th of December. 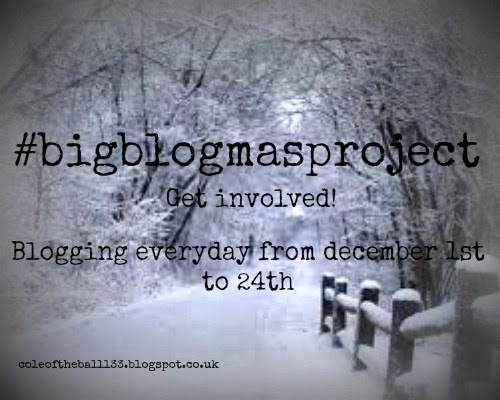 So if you want to keep up with the posts keep your eye on the #bigblogmasproject hashtag on twitter. This is were all the lovely bloggers involved will be tweeting their posts. I would love for you all to check out the lovely ladies involved in this project all their links are below, and if you do happen to have a look leave them a comment telling them I sent you. I really hope you enjoy reading mine and everyone else's posts. All links are using twitter handles to avoid confusion! I am so excited for this! I was wondering can you make a badge or a logo that we can all put on our blogs to let people know we are taking part in #bigblogmasproject. Maybe could you do it so it had html below it so we can copy that onto our blogs? Yo Cole, I'm so excited to be a part of this project! I just posted my link about it here: http://sassydove.com/beautiful-holiday-bigblogmasproject/ Enjoy, ladies! I would love to join... How can I join the project ? I'm a baby blogger just starting out but I would love love love to join in! Is it to late?